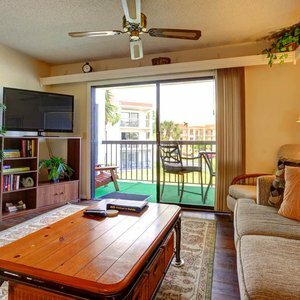 Enjoy the beach from our relaxing, nicely appointed condo at Ocean Village Club G21. 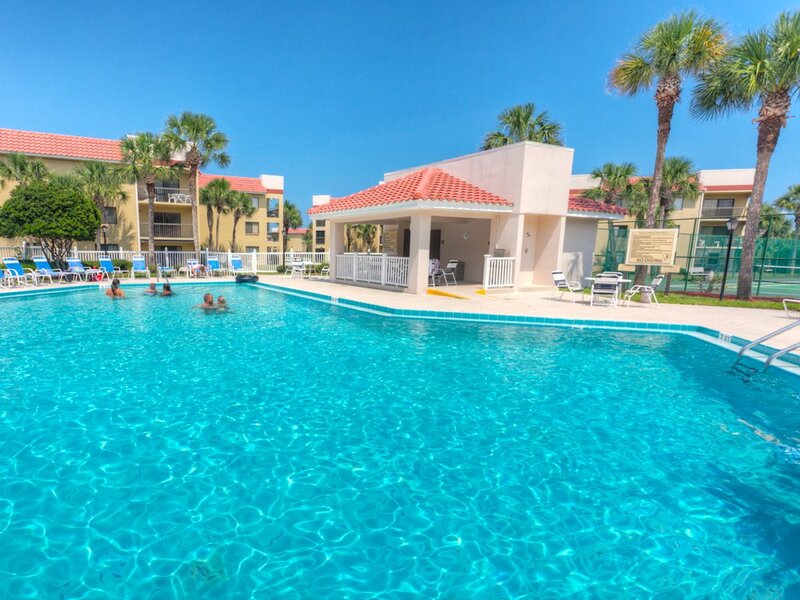 Located in a gated, family-oriented resort with all the amenities, it's convenient to major attractions and activities. 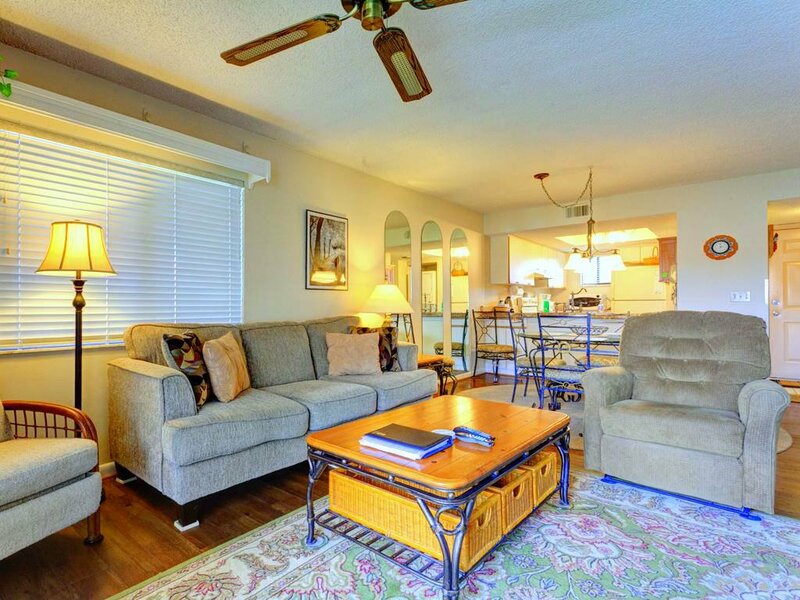 You'll love this comfortable home away from home! 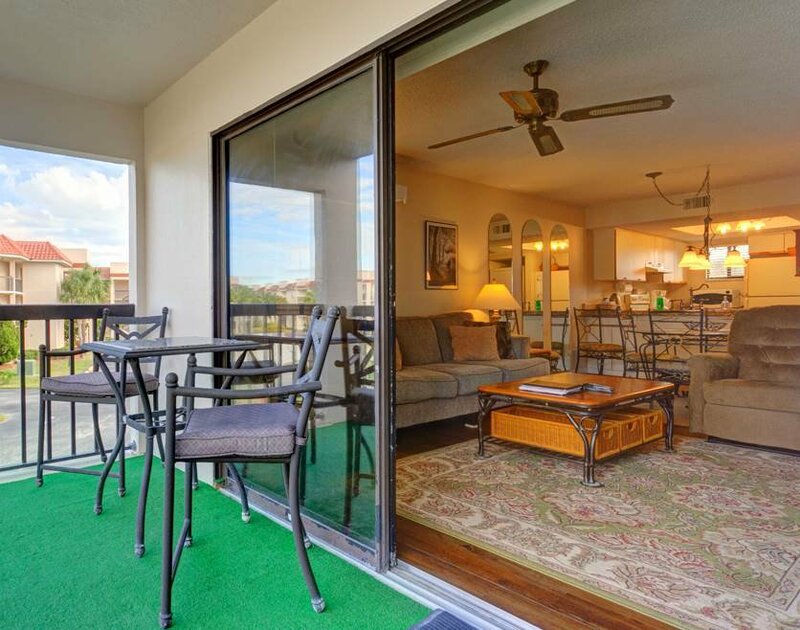 The first thing you'll notice about our second-story condo is the lanai. 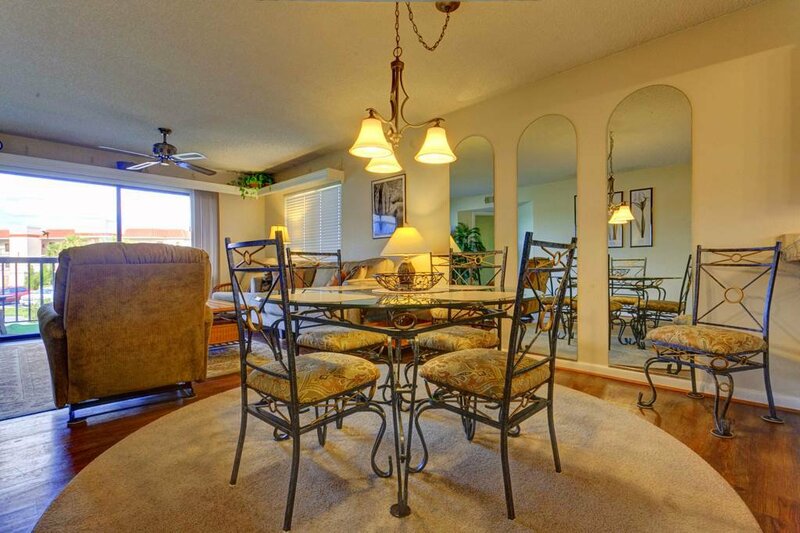 Spacious and shaded, it overlooks the grounds of Ocean Village Club. 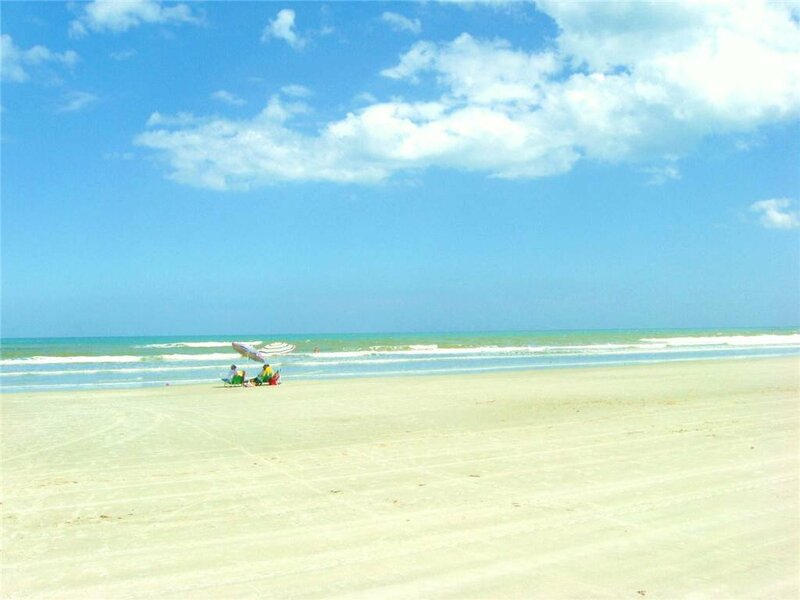 Step out here and you immediately feel the salty ocean breeze! 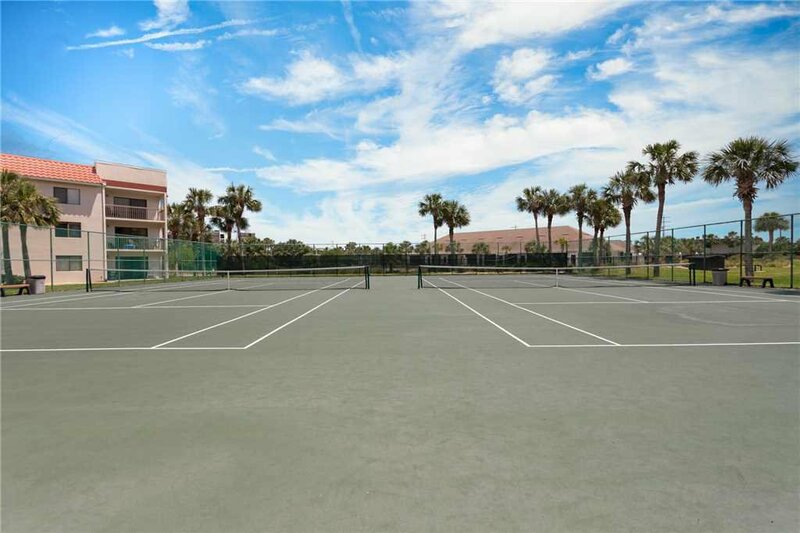 Gaze out over the resort and select your next treat: will it be a quick dip in the pool just yards from your door, a tennis match at the nearby courts? Ah, the joys of vacation! Our patio is big enough for the whole family to dine and relax, and if you can wake up early enough one morning, it's also a great place to watch the sunrise. 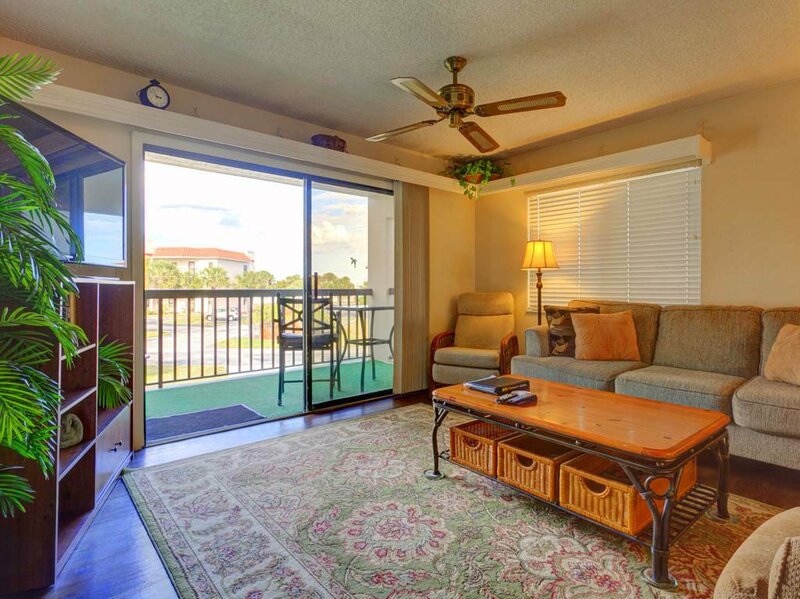 Step inside from the lanai and you are in our living room, refreshed by the ceiling fan and soothing neutral tones. This is a great place to relax or entertain. 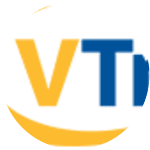 Our large TV and DVD deliver your favorite movies and music, and with our cable package, you can always find the big game on TV. 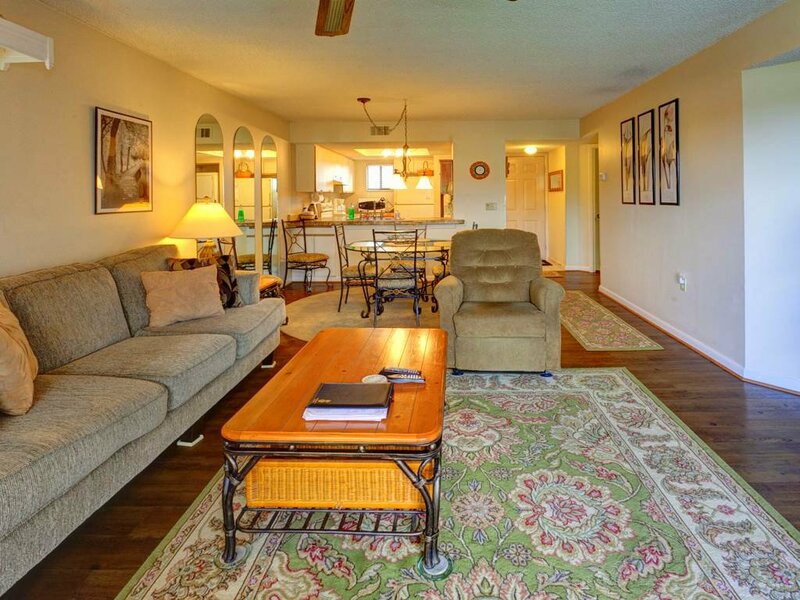 Flop down on the ultra-comfortable couch, loveseat, or recliner and enjoy a little downtime! The dining area is light and airy as well. A modern Tiffany-style lamp hangs above our glass-topped table, which seats 4 easily and 6 in a pinch. 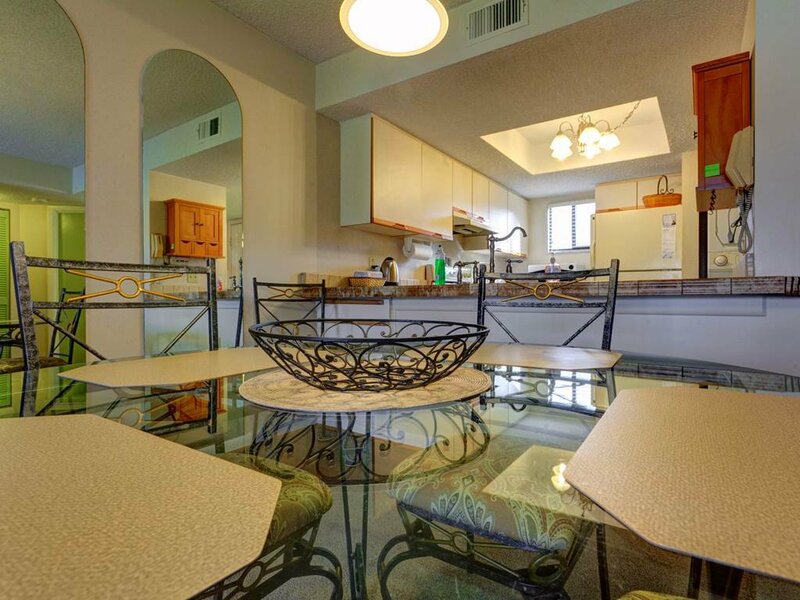 This is a lovely place to dine, and also a handy space for setting up the laptop (you have free wireless Internet inside the unit) and playing games. 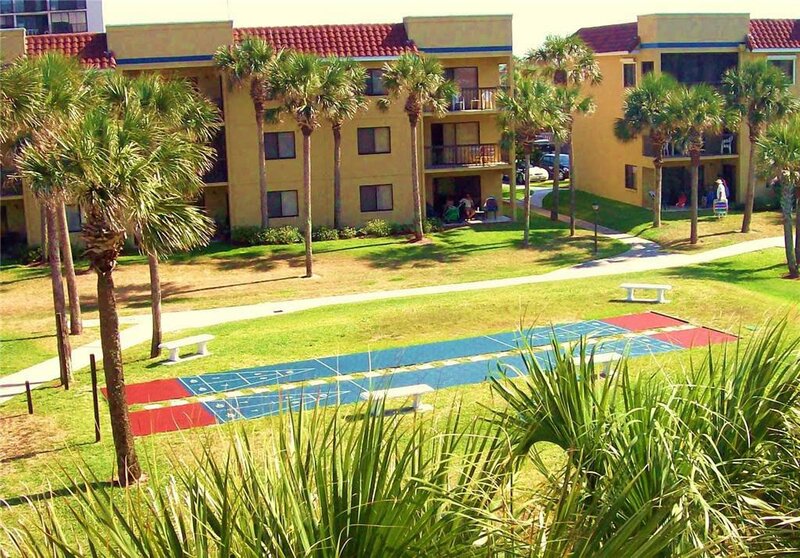 Break out the dominoes, listen to your favorite CDs, and bliss out at the beach! 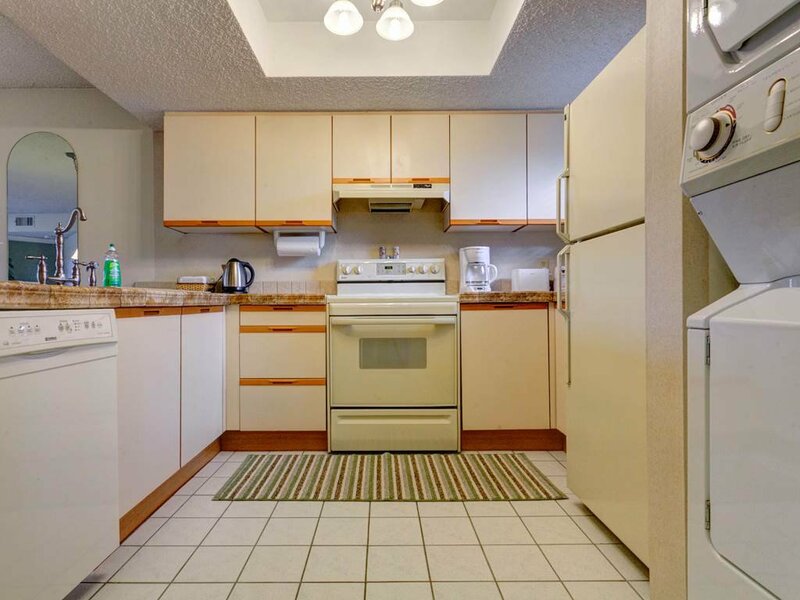 No matter what your dining plans are for this trip, you'll appreciate our handy, fully equipped kitchen. 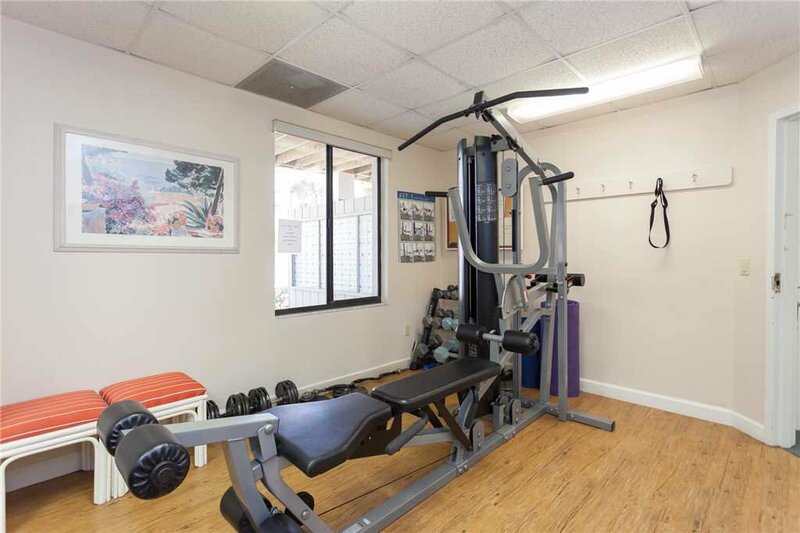 It boasts all the major and minor appliances, spotlessly clean and beautifully maintained, plus all the cookware, dishes, and utensils you would need to prepare and serve a feast. If takeout is more your style, you'll get a lot of use out of the microwave. And our big refrigerator means that you can do a full shopping at a grocery store (instead of one of those high-priced markets) and stay stocked up for the whole trip! 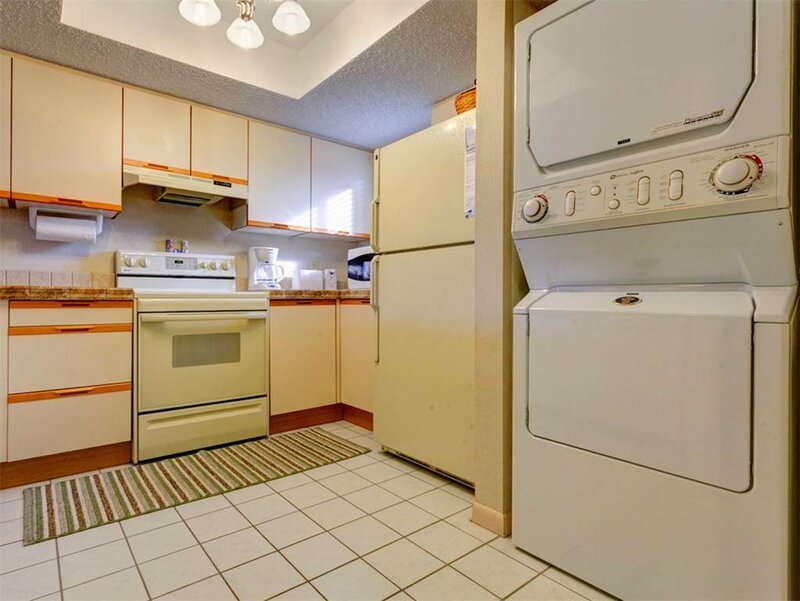 But the best part is just beyond the kitchen, tucked into a closet. 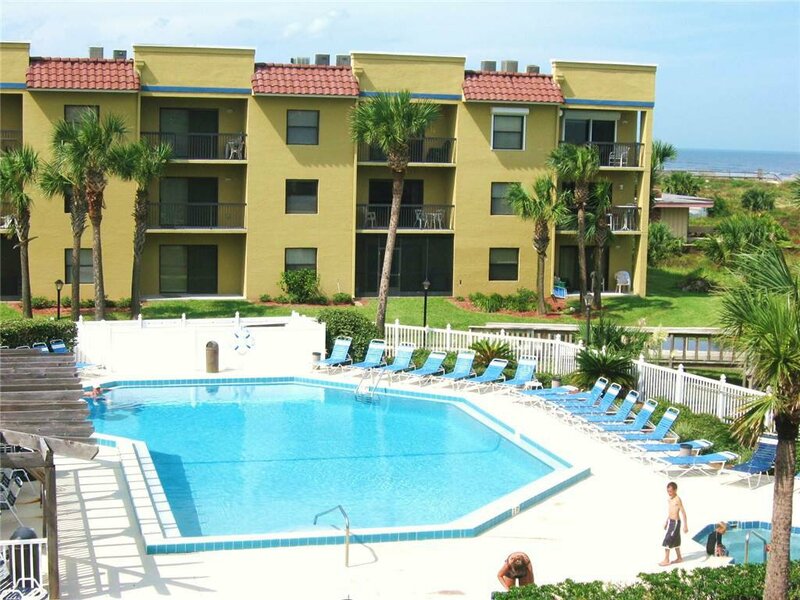 It's our stacked washer and dryer, ready to tackle all those wet towels and damp swimsuits! You can throw in a load as you're leaving the condo and not worry about it all day. As much as you'll enjoy the living area of Ocean Village Club G21, it's the sleep spaces you may come to really love. 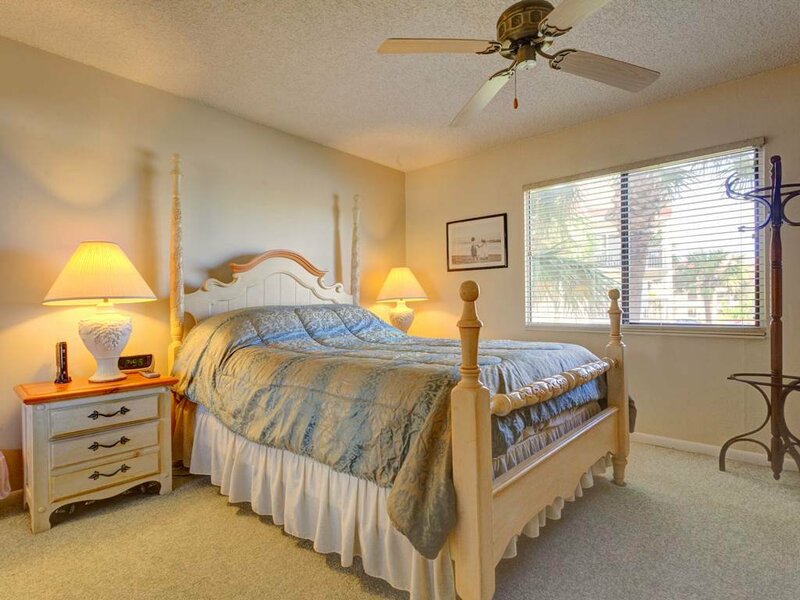 The master suite is heaven, with a super comfortable queen-size bed, private TV, sliding glass door to the lanai, and en suite master bathroom. 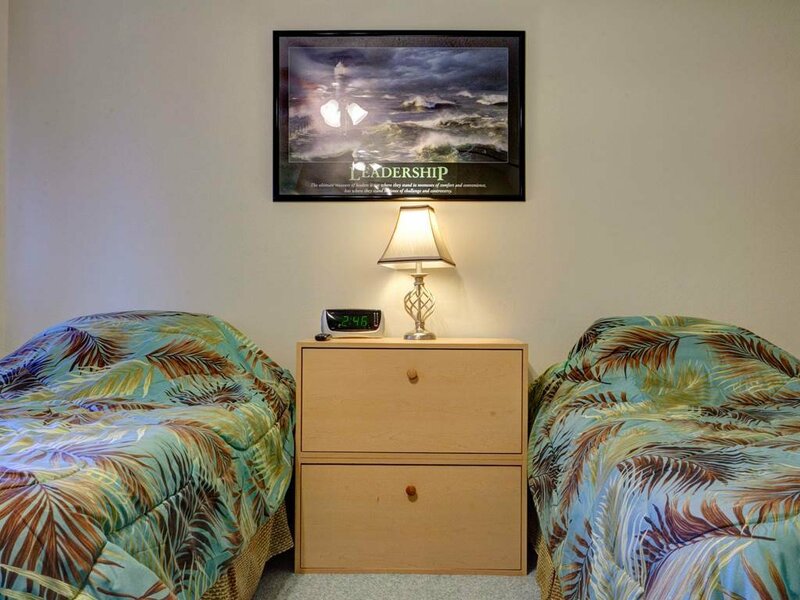 This is a room to retire in with pleasure every night. 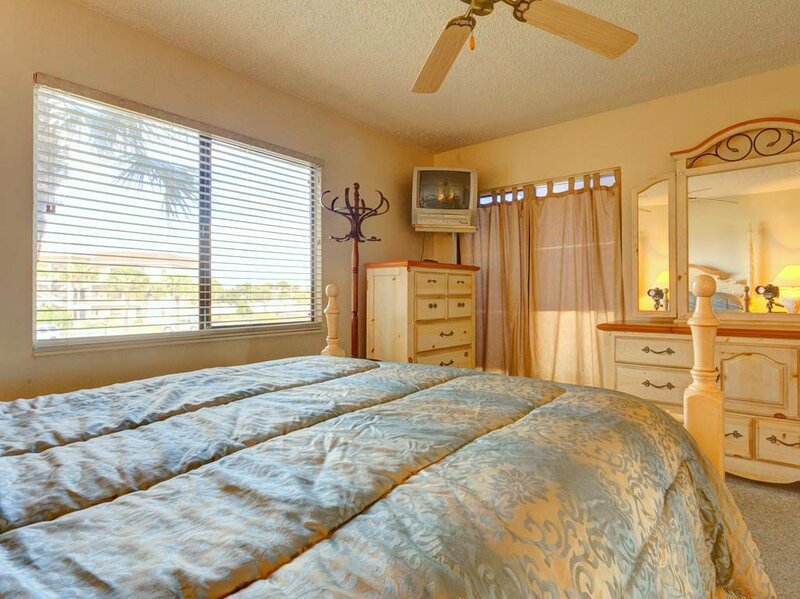 Leave the drapes open one night and stargaze from your bed! 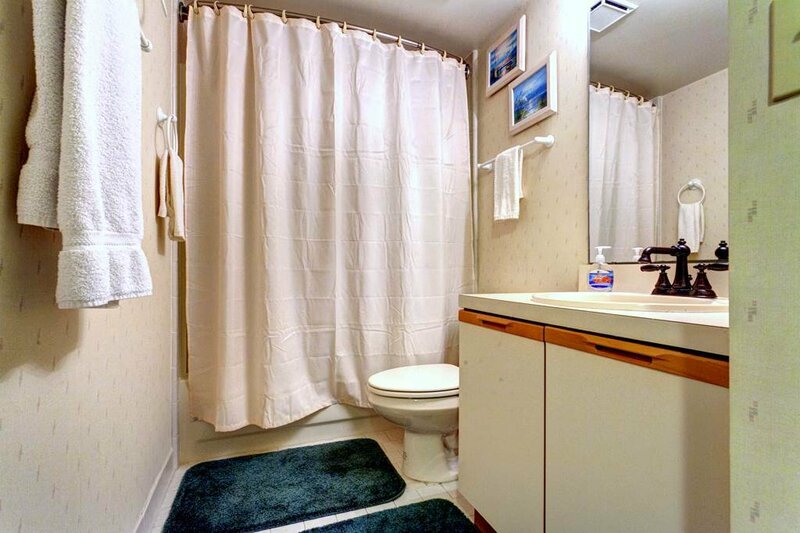 The master bathroom is a treat as well, with a separate powder room area and a hand-held nozzle in the shower. There is a bathtub as well, and all towels (plus linens, blankets, and pillows) are provided at Ocean Village Club G21. 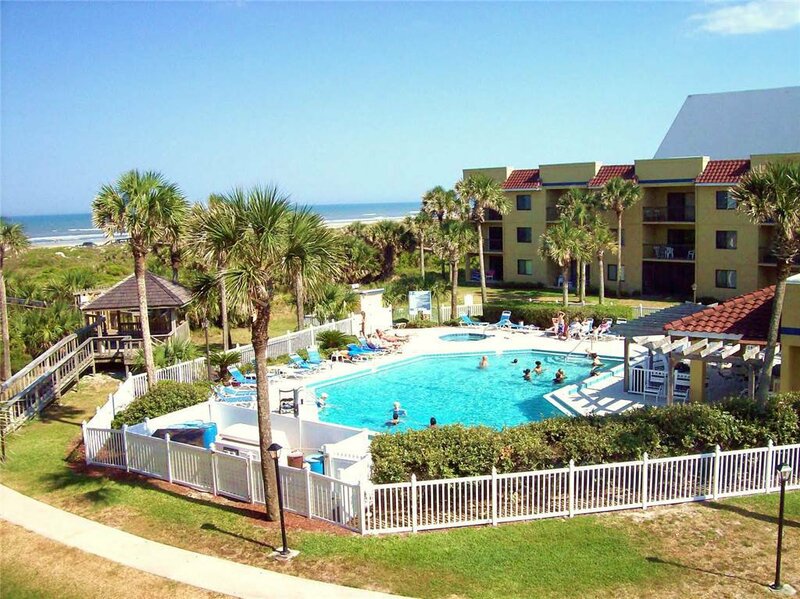 You never have to worry about packing all those "just in case" items when you stay here! 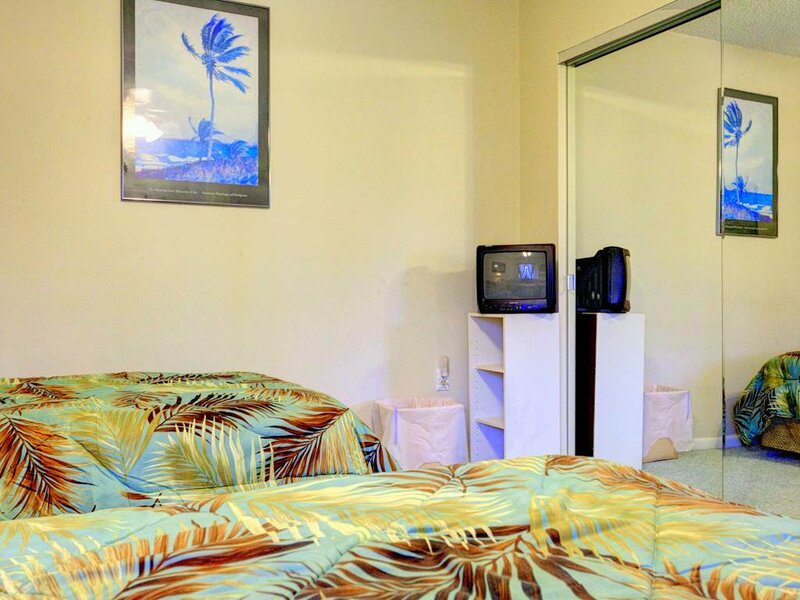 The second bedroom is a cozy room for napping and sleeping. It contains 2 twin beds, plus plenty of storage and floor space in case the kids want to spread out their toys. 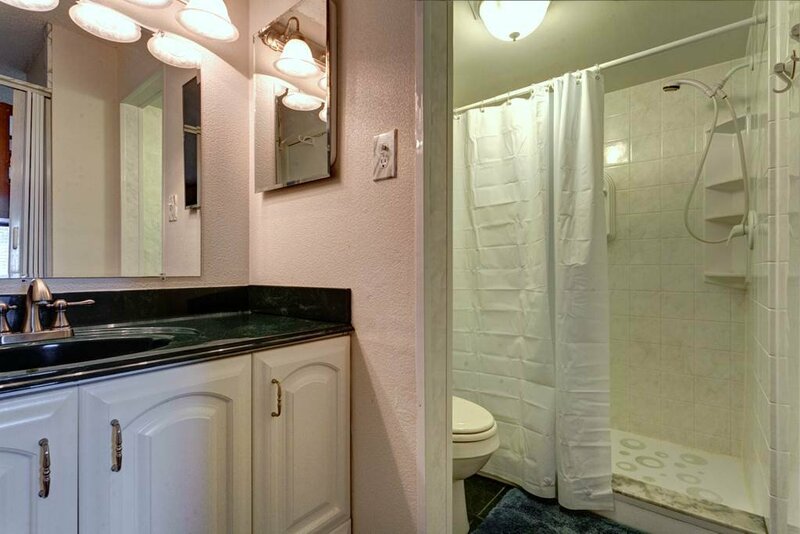 The second bathroom is located just outside the door of this room, and is fully appointed with a bathtub as well as a shower. Everyone's provided for nicely, with no need for lines in front of the bathroom every morning! 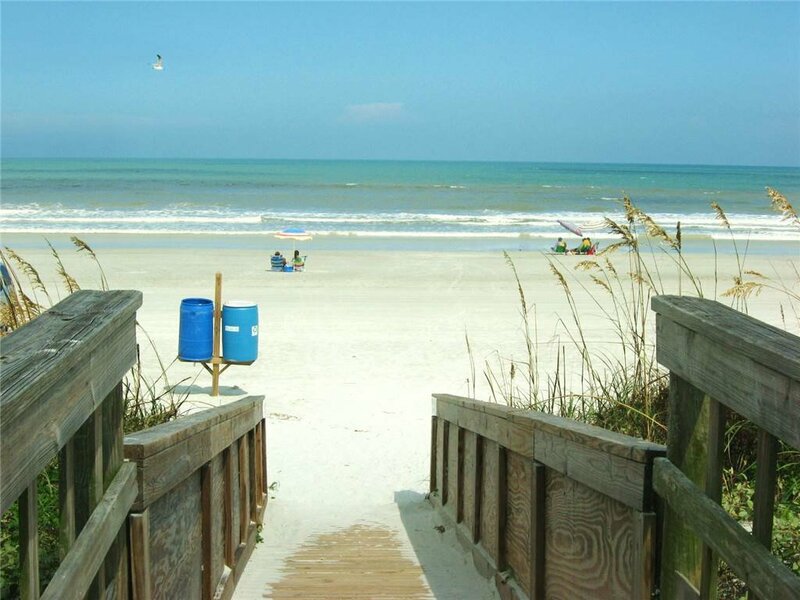 And when it's time to go to the beach, our private walkway takes you right over the dunes and down to the soft white sands. 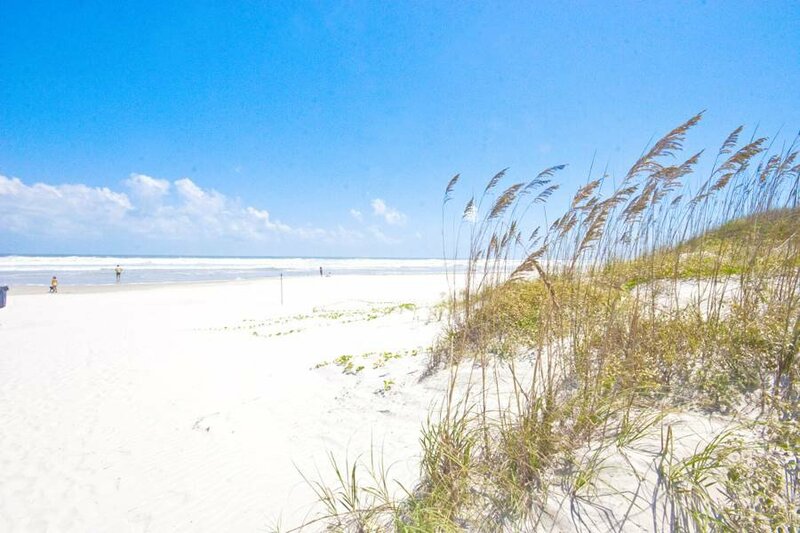 St. Augustine Beach is a family-friendly place, with rolling waves and plenty of space for playing in the sand. 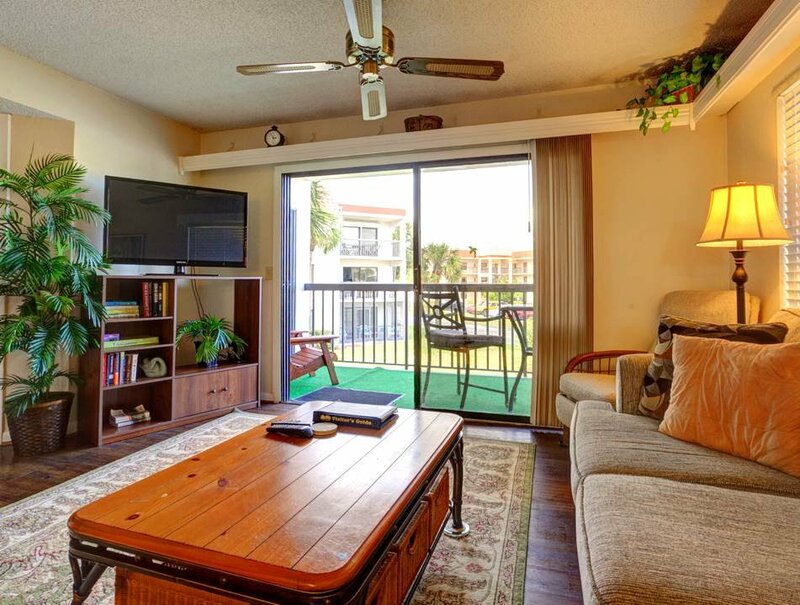 You can rent watercraft nearby, fish in the surf, and beachcomb. 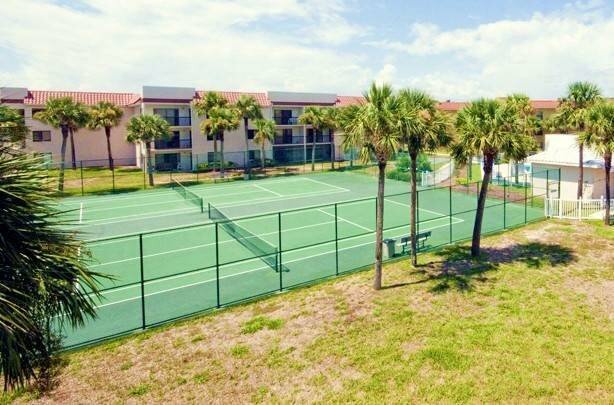 The Intracoastal is just minutes away, with wildlife, calmer waters, and nature trails. 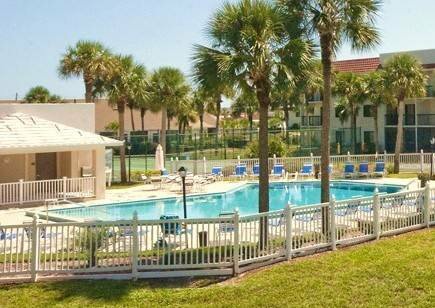 And you're just 15 minutes from historic St. Augustine, with fine dining, shopping, & sightseeing. Ocean Village Club G21 is your choice.